If only the best quality is good enough for you, then this Rolex Explorer 1016 should get your attention. The pristine original condition and important papers set this vintage watch from 1965 above other timepieces from this period. The Rolex Explorer combines classic design and reliable mechanics. 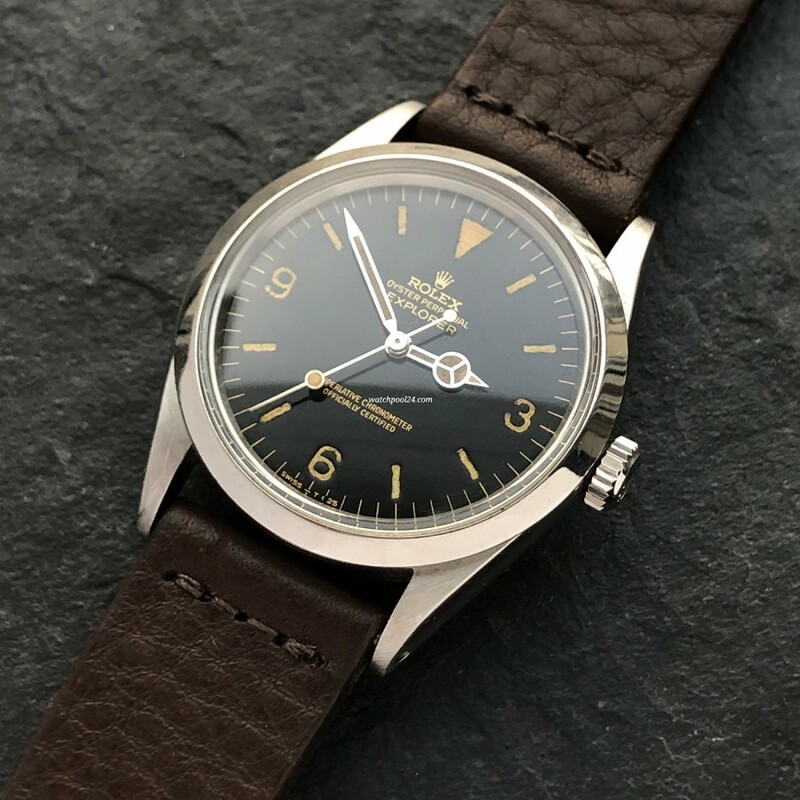 Its story starts in 1953 as climbers Sir Edmund Hillary and Tenzing Norgays were equipped with a prototype of the Rolex Explorer for the first ascent of Mount Everest. After this successful and pioneering expedition Rolex introduced in the same year the brand new Oyster Perpetual Explorer. The first watch with the reference 1016 was presented in 1963 and is arguably the most famous edition of the Rolex Explorer, which was produced until 1989. The name "Rolex Explorer" is mostly associated with this iconic reference 1016. The Rolex Explorer 1016 offered here was produced in 1965, which is proven by the accompanying original Watch Rate Certificate of May 7, 1965. In addition, there is the original Warranty Book, which shows the sales date 23.3.1966 and the seller - Artland Watch Co., Hong Kong. Both documents are signed with the serial number, which is impressed into the papers. "Perfectly balanced elegance" - this could be the short description of the dial of the Explorer. The defining feature of the Explorer is its clear and legible design. The glossy dial is printed with the golden lettering (gilt dial). The black glossy surface has been perfectly preserved and has no noteworthy flaws. The natural aging of the luminescent material is absolutely evenly in the hour indices and hands. The condition of the Oyster case of this over fifty years old vintage watch is quite impressive. It is unpolished and free from scratches. The perfect diameter of 36mm and the flat profile ensure a comfortable wearing on the wrist. This Rolex Explorer is powered by the automatic caliber 1560. It has been checked and runs flawlessly, keeing time exactly. Important history, legendary design, pristine condition and the original papers make this Rolex Explorer 1016 the crème de la crème of vintage Rolex watches.